The poem that opens Krystyna Miłobędzka’s book of poetry Imiesłowy is ruled by pronouns. Of the 15 lexical units that comprise the poem, a full six of them are pronouns, of which four are demonstrative (“to,” “to,” „tej,” “tamtej”), and two universal (“każdym,” “każdej”). The twice-repeated demonstrative pronoun “to” appears to relate to a certain absent or unrepresented object of the poetic utterance, the “that” which is never fully present and somehow can never quite be captured using a verb in the third-person singular, present tense. Here our attention is seized by the fact that the poem being analyzed demands that the reader simultaneously read it as an utterance relating to extra-linguistic reality (a certain “that” beyond the poem, “is not”) and language itself (“that” “is” not), which the poem’s subject tries to bring as close as possible to fleeting existence. This double coding imposed on reading – essentially demonstrating the inevitable cognitive failure of the subject, whose experience always evaporates when there is a desire to articulate it – constitutes a typical feature of the “poetics of the particle,” whether of recording or movement, which plays an important role in Miłobędzka’s later work. We should nonetheless return to the pronouns mentioned earlier – dependent parts of speech, for the execution of whose function the context of a whole utterance or situation wherein communication takes place is necessary. The poem does not provide any clues that would allow the “that” (to) to be fixed to a particular referent. It may refer either to a highly concrete, singular phenomenon (as in the sentence “Look at that”) or to the entirety of the sensory world (“That’s all there is”). This tension between particularity and universality present in the individual word “that” when not subordinated to other parts of speech is also visible in the division, mentioned earlier, of pronouns according to their function – some (“tej”, “tamtej”) attempt to indicate or situate a certain object or phenomenon in time-space, while others (“każdym,” “każdej”) refer to all (people? animals? objects?) that exist in the whole infinity of moments. The tension indicated above between the pronouns present in the text can also be seen in the semantics of the verb forms used in the poem. As was mentioned earlier, the poem begins with a negation of the full presence of what is experienced and a simultaneous denial of the cognitive force of verbs in the present tense. In the next turns out that it constitutes the beginning of a parody, developed throughout the rest of the poem, of philosophical judgment, which, on a first reading, can be read as the choice of a “more receptive form” of line, however, a perspective opens onto an exit from the impasse. “That would be,” until it turns out that it constitutes the beginning of a parody, developed throughout the rest of the poem, of philosophical judgment, can, on a first reading, be read as the choice of a “more receptive form” of linguistic expression, that will probably allow the poetic word to catch up with the world. This momentary hope for the realization of Utopia is given by a verb in the conditional mood, “expressing, containing, or implying a supposition.” Existence, Miłobędzka tells us, tends rather toward potentiality than simply being this-right-here. At the same time, in the Polish form, meaning “that would be” (to byłoby), the past tense still resonates, a certain “was” (było), the symptom of the world’s inevitable evanescence. In the strange temporal structure created between the two first lines, one excluding the present, the subject of the poem – in the second required to read the next line – seems to express a belief in the possibility of capturing reality in its unfolding, by means of language. If we were to remove that parenthetical interpolation – and the fourth line were to become “w każdej chwili” (at every moment) – the whole poem could lead the reader to the conviction that the poet reached certain conclusions, closing her reflections on the temporality of being in an extremely atemporal, stable philosophical formula. The parenthetical interpolation in question, however, makes such a reading of the work impossible. It is a symbol of a temporary split (between naming and experiencing, writing and thinking), which through the manner of its notation and its place in the line in its entirety shows what it names – it graphically dissociates the noun from the pronoun and preposition, rendering impossible the existence of such a combination of words as “at every moment,” falsifying the temporal, historical nature of the experience of reality. The parentheses surrounding both pronouns represent one of two forms of punctuation present in the poem. The other is the comma that separates “tej” from “już tamtej.” Where the poet’s motivation for using parentheses has been explained above, the comma demands a few additional words of commentary. First, we should consider how the end of the poem might be interpreted if it lacked the comma. The line “w każdej (tej już tamtej) chwili” could certainly still be interpreted as a critique of atemporal thought about being which somehow still always takes place in time. The meaning of the phrase in parenthesis would then undergo a small change – the first pronoun could then be treated as redundant with respect to the second, since they refer to the same (“that”) moment. The presence of the comma, however, produces the result that within the parentheses itself, introducing a temporal shift at the end of the poem, another, still more subtle division is created, as if the poet believed that she had not clearly enough underscored how word and experience miss each other. Thus we are no longer dealing with one moment that passed, but with two separate micromoments, the one preceding the comma and the one that comes after it. The internal rhyme in the last line (“każdej,” “tej,” “tamtej”), which sounds like an echo, makes the impossibility of capturing the “now” in linguistic form even more pronounced. The comma in question is nevertheless more than just a symbol of what in the next poem in Imiesłowy is defined as “Odstęp od myślę do mówię” (the distance from I think to I say; ZG, p. 212). If we take into consideration the fact that the poetics of recording or “movement” that dominate the book suggests reading the text of the work as a “pursuit of the moment,” then the comma can be seen as designating a pause in the recording, which is the only way to save the nonverbal, that which eludes linguistic representation. What the reader stumbles up against while reading the poem, i.e., the little punctuation mark that differentiates the semantic content of two pronouns can be interpreted as a microscopic trace of what the writing subject stumbled up against in the course of the recording-movement – of real experience. If, as Stanisław Barańczak has said, Miłobędzka’s removal of punctuation from her poetry gives the impression of “speaking on a single breath,” then the comma in the poem “[to nie jest]” would be a symbol of speech that reached the point of interruption (or: breakthrough), close to what the poet writes about in this passage of self-reflexive poetics from Imiesłowy: “Niegotowe, niecałe [zapisy], pełno w nich dziur (gdyby chociaż świeciły pustkami)” (Unprepared, incomplete [records], full of holes [if they could at least shine as voids]; ZG, p. 228). In the world of Miłobędzka’s poetry, where each linguistic sprint across the distance between experience and speech is doomed to failure, the residue of punctuation after the encounter with the world that takes place in the poem “[to nie jest]” can be interpreted as an attempt to save within the materiality of the sign what does not fit into verbs in the present tense. One of the many holes that do not shine as a void is perhaps precisely this comma, the sign separating (language/subject from the world), but also joining (language/subject to the world) exactly in the same place where the division is executed. It is, however, worth attempting to examine this poem with a micrological magnifying glass – perhaps then we will succeed in noticing and clarifying those elements in it which escape a surface reading. The first among those is the intertextual relation that is formed between “[nawet gdybym…]” and “[to nie jest].” The beginning of the poem, “nawet gdybym zdążyła,” uses the same conditional mood we see in the first poem Imiesłowy: “gdyby zdążyło (…)” (if it happened […]; ZG, p. 211). The change in the grammatical categories of verbs between the two poems – the shift from the impersonal and neuter “gdyby zdążyło” to the first-person, feminine “gdybym zdążyła” – is the vehicle for a change in the cognitive perspectives of the subject. Where in the first poem in Imiesłowy, as was mentioned above, full embodiment is expected from being, in everyone and at every moment, in the work analyzed herein the subject seeks to affirm its presence in the face of a real phenomenon – a cloud. At the level of play with the semantics of the visual form in which the poem is written, “[nawet gdybym…]” references the first poem in Imiesłowy. The temporal-spatial separation between the exclamation “jestem” and the addressee of this communication (the lowest cloud, and thus one that can be reached with a word), who is referenced in the line “jesteś będzie już inne, w innym miejscu,” relates, after all, to the position of the verb form “jesteś” in relation to the previous line as well. The verb form “jestem” exclaimed in the direction of the noun “chmura” finds itself in a relatively close position to that lexical unit (and at least is not set apart from it by a parenthetical interpolation). At the same time, the verb form “jesteś” is actually in a different place (“w innym miejscu”) in relation to those words – it is located at the beginning of the second line, dissociated from the textual cloud by a space of 15 syllables. The only punctuation mark in the whole two-line poem, the phantom comma that was confusing among the pronouns of “[to nie jest],” merely highlights the separation mentioned above. This fairly clear interpretation of the poem is complicated by considerations of how we should properly understand the passage “jesteś będzie już inne, w innym miejscu” in relation to the word “jestem” that precedes it. The shift from first to second person singular can be explained in a number of ways, differentiated according to which verb is accentuated. The word “jesteś” in the second line can thus constitute a metatextual statement in which two speakers become one (X speaking about an utterance by X) despite the change in grammatical category. The poetic self expresses itself in the second person, thereby showing that the cry in the first line, supposed to confirm that self’s presence, in fact separates from it and then changes into the distanced “you” of “jesteś.” The speaking subject of the poem would thus become other in a different place – the final part of the work would then be a kind of hypallage, in which properties usually ascribed to clouds (variability of shape and continuous mobility) would be transferred to the subject. A completely different interpretation is also possible – one in which the cry of “jestem” has the purpose of affirming the presence not only of the self, but also of the lowest cloud. “Jesteś” would then be the “you” called into being by the mere intention of the subject’s crying out. The cloud, however, continually changes shape and continues to move, so that the verb in the present tense (of which we know from “[to nie jest]”) does not exactly fit for describing such an evanescent phenomenon. The poem in no way allows us to judge which of the interpretations offered above of the relationship between “jestem” and “jesteś” is more on point – and that is not the point here. “Zapisać bieg myśli bieg słów w biegnącym świecie” (To write down the flow of thoughts the flow of words in a flowing world; ZG, p. 212) can only be done by rendering the poem polysemic, so that the reversible relationship of subject and object remained in constant movement. The fragmentation of the word “chmurze” into two syllables separated by a hyphen and the addition of the comma after the second of those syllables – this is the minute but monumental difference between the “[nawet gdybym…]” 2000 and 2006 versions. The first change significantly influences the flow of the whole (extremely short) work, because such a procedure’s effect on the modulation of the rhythm is more tumultuous than, for example, enjambment. So that instead of fluidly shifting from one line to the next, we stumble into the hyphen hanging at the end of the line, which interrupts the subject’s utterance in the exact middle of a word. It is notable that this interruption performs a function similar to the parenthetical interpolation we discussed in “[to nie jest]” – it performatively shows the temporal dispersal of articulation and experience. Before the reader finishes reading the second stanza of the work, she or he can observe in the text’s notation that “jesteś będzie już inne, w innym miejscu,” and that a syllable of the word “chmurze” appears to escape from the verb in present tense. The division of the word into two syllables also has the effect that the ambiguity mentioned above in the relationship between “jestem” and “jesteś” is not so much negated as it is pushed off into the semantic background. It is perfectly evident that what undergoes change in the space of the poem is the textual cloud, rather than the articulating subject – because the cloud is stratified into separate syllables. What other effects does the separation of the word “chmurze” serve to create? What matters is not the question of the motivation behind such micro-changes, which we have no way of finding out, but rather what they can add to our interpretation of “[nawet gdybym…],” knowing as we do how they affect its multiplicity of meanings. In keeping with the lcues we have found, let us focus on the cloud. In our earlier interpretation of the poem, the adjective “najniższej” was understood as describing a certain extratextual cloud remembered by the poet. It allowed us to conceive of a spatialization, unspoken within the poem itself, of the word “jestem,” which due to the fact that the cloud is located lowest, could manage to reach it. The breakup of the word into two syllables placed in two separate lines suggests, however, a different, considerably more intratextual reading. So because the lowest cloud may be considered to be the second syllable of “chmurze,” “-rze,” as it has shifted to the second line and is set apart from the now overhanging (and therefore certainly no longer lowest) syllable “chmu.” This broken, semantically non-autonomous lexical particle, being a symbol of the intrusion of temporality (from which, in the world of Miłobędzka’s poetry, there is no escape) into the poem, could thus point to the fact that within this one poem there is a chance of saving a certain experience. It turns out that the moment of clear confirmation of cognitive failure (a change in the shape of the word signifying a cloud at a moment before the assertion of its absolute variability, i.e., an admission of failure) becomes a chance to capture in language what has run away, what has dissipated. The inherent paradox stems from the fact that the trace remaining from an encounter with the external world – similarly as in “[to nie jest]” – is often a result of the text, which leaves in its wake only a comma, hyphen or fractured syllables. Perhaps that is enough, too, for us to bring into being, in our micrological analysis, the postulate expressed by Miłobędzka in the self-reflexive work mentioned above: “Gdyby ktoś przeczytał to zapisane i to niezapisane” (If somebody read all of this written and unwritten material; ZG, p. 228). There is another possible explanation for the changes to the poem “[to nie jest]” examined above, one considerably more down-to-earth and, unfortunately, also potentially destructive of the whole earlier interpretation. Thus both the breakup of the word “chmurze” into two separate syllables, and the placement of the comma after “rze” could simply render the text a complex sentence, in keeping with the rules of Polish punctuation (the added comma just sets one predicate apart from another). We cannot rule out that these small changes were entered by a copy editor’s hand, or that it was important for Miłobędzka for the work to be interpreted as a text with a slightly different status from the rest. We cannot rule out the possibility that our entire analysis of two poems from Imiesłowy has in fact all been one big philological farce. It is not entirely […] apparent what differentiates the two classes of remnants, at the surface level simply opposites: treasures and trash. For each true collector (or philologist or art historian) it remains an open question. Because, appearances to the contrary, there is no certainty in dividing them, only the possibility of a two-sided exchange. […] It is particularly easy to disregard fragments that are severely damaged or particularly slight. Such is the status of a remainder, including the remainder from a calculation, whose frailty makes it invisible, insignificant and in the end dooms it to the annihilation called rounding-off. But in fact that remainder in the distant places after the comma, though deemed null and void, does not cease to exist. Rendering visible, if only for a moment, such details as two commas and a hyphen present in a work by a poet of such secure renown in Polish literature as Miłobędzka, is undoubtedly worth the risk of descending into the ridiculous. 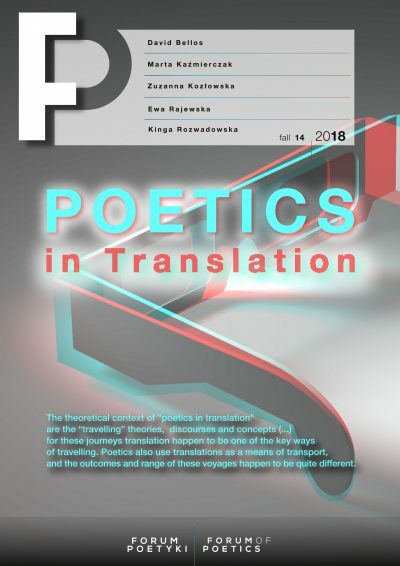 This interpretative essayistic article is devoted to a detailed micrological analysis of Krystyna Miłobędzka’s poems in her book Imiesłowy (Participles). The author attempts to show how three punctuation signs – two commas and one hyphen – can diametrically alter the surface interpretation of a work in the event of such seemingly minor details being omitted. In his conclusion, the author raises the question of whether it is possible, within a micrological analysis, to speak of separating interpretation from the philologist-collector’s pure overinterpretation. K. Miłobędzka, “[to nie jest]” (that is not), in: Zbierane, gubione 1960 –2010 (Collected, Lost 1960-2010), Wrocław 2010, p. 211. Where not indicated in a footnote, all quotations from Imiesłowy by Krystyna Miłobędzka in the main text of this article will be referred to by the abbreviation “ZG” followed by the relevant page number. It is also possible that the line “to nie jest” is building an intertextual relationship with the poem “TO” (THAT) by Czesław Miłosz, published in 2000 (the same year as Imiesłowy), wherein the poet repeatedly asserts “TO jest (…)” (THAT is…). Cz. Miłosz, “TO,” in to, Kraków 2000, pp. 7 –8. I will leave the task of evaluating that claim to other members of the micrological community, adding only that the fundamental difference between Miłobędzka’s “to” and Miłosz’s “TO” has to do with the semantic baggage of both words, Where Miłobędzka sees no difference between the trivial “to” and the metaphysical “TO,” Miłosz (in the work in question) differentiates strongly between them. As Aleksandra Zasępa has observed, “Miłobędzka’s interest in language is a natural consequence of her interest in the world.” A. Zasępa, “‘Bieg myśli/Bieg słów’. Język poetycki wobec wyzwań rzeczywistości uczasowionej” (“Movement of Thoughts/Movement of Words.” Poetic Language and the Challenges of Time-Specific Reality), in Czas (w) poezji Krystyny Miłobędzkiej (Time (in the) Poetry of Krystyna Miłobędzka), Wrocław 2016, p. 205. P. Bogalecki, Niedorozmowy. Kategoria niezrozumiałości w poezji Krystyny Miłobędzkiej (Unspoken Conversations. The Category of Incomprehensibility in the Poetry of Krystyna Miłobędzka), Warszawa 2011, p. 30. “Te zapisy (…)” (Those records; ZG, s. 228); “nie pisać, biec” (not write, run; ZG, s. 213). “The pivotal role performed in the grammatical texture of poetry by diverse kinds of pronouns is due to the fact that pronouns, in contradistinction to all other autonomous words, are purely grammatical, relational units […].”R. Jakobson, “Poetry of Grammar and Grammar of Poetry,” in Verbal Art, Verbal Sign, Verbal Time, ed. Krystyna Pomorska and Stephen Rudy, Minneapolis 1985, p. 44. As Zasępa concludes, “[t]he present moment […] is […] the embodiment of impermanence, because, unceasingly chainging, it never leaves time to become rooted or to experience perfect happiness long-term […].” A. Zasępa, “Nieuchwytnie” (Unattainably), in Czas (w) poezji Krystyny Miłobędzkiej, p. 77. Definition 2 of “conditional,” Merriam-Webster Dictionary, https://www.merriam-webster.com/dictionary/conditional (accessed 23.05.2017). Similarly in the poem “[co ja robię, patrzę w jest]” (what i’m doing, i’m looking at is): “to jestnienie/ jest nie nie” (that yesistence / is not not; ZG, p. 224). Lines 3 and 4 each have 8 syllables, while 1 and 2 have 3 and 4 respectively. This is a quotation from the chapter title in Aleksandra Zasępa’s book. 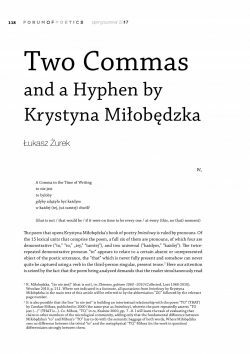 Piotr Bogalecki made the following observation on a similar way commas function in Miłobędzka’s work (in an interpretation of the second poem in the book Wykaz treści [List of Contents]): “Miłobędzka does not renounce commas, but uses them in such a way as to provoke multiple versions of a reading, enabling the reader to follow several paths of understanding.” P. Bogalecki, Niedorozmowy, p. 147. – simultaneously containing, as in the case of “to byłoby,” both memory of the past and leaning into the future – divides the word into “tam” and “tej.” The parenthetical interpolation can thus be interpreted to be not a critique of philosophy for forgetting about existence’s temporality, but an attempt to positively develop a more capacious form of pronoun, able to keep up with the vanishing moment. E. Suszek, Szybkość, pośpiech, kompresja. „Poetyka przyśpieszenia” w poezji Krystyny Miłobędzkiej, (Speed, Haste, Compression. The “Poetics of Acceleration” in the Poetry of Krystyna Miłobędzka), Katowice 2014, p. 8. S. Barańczak, In statu nascendi, in Twórczość (Creation) 1971, no. 9, p. 101. Quoted in: A. Zasępa, Czas (w) poezji Krystyny Miłobędzkiej, p. 207. “The comma is, in contemporary norms of punctuation, both Polish and Italian, the most universal punctuation mark (…) it can perform a great variety of functions, often contradictory ones.” K. Foremniak, O sztuce przestankowania w Polsce i we Włoszech: rozwój normy interpunkcyjnej od XVI wieku do współczesności (On the Art of Punctuation in Poland and Italy: the Development of Punctuation Norms from the 16th Century to the Present), Warszawa 2014, p. 271. Adam Lipszyc draws attention to the very similar roles played by the commas in this poem and in “[to nie jest]” in his micrological interpretation of Paul Celan’s poem “ERZFLITTER” (translated by Lipszyca into Polish as “ARCYBLICHTR RUDY” [ORANGE ULTRABLING]): “This comma [separating ‘taciturnity’ from ‘lucidity’] would signify neither temporal, irreversible replacement, nor oscillation, but a paradoxical, superimposed simultaneity, this hypertextuality that splits up the ordinary temporal-spatial present, and simultaneously itself remains internally unstable and divided.” A. Lipszyc, “Powrót K” (Return K), in Czas wiersza. Paul Celan i teologie literackie (Time of the Poem. Paul Celan and Literary Theology), Kraków-Budapest 2015, p. 192. K. Miłobędzka, Imiesłowy, Wrocław 2000, p. 8. P. Bogalecki, Niedorozmowy, p. 31. I borrow this figure of clarification, of the clarifier [objaśniacz], from Stefan Szymutko (“Po co literatura jeszcze jest? Na motywach książek Janusza Sławińskiego ‘Przypadki poezji’ i ‘Miejsce interpretacji’” [Why Does Literature Exist? On Themes of Janusz Sławiński’s Books The Case of Poetry and The Place of Interpretation], Teksty Drugie 2007, no. 3, pp. 142 –153), who in turn plucked it from one sentence in a text by Janusz Sławiński: “Naturally to a significant extent this relates to [the reading of contemporary poetry] […] with professional needsm with the desire to publicly speak about what one has read – appearing in the role of their critic or clarifier” (J. Sławiński, “Zanik centrali” [The Decline of Headquarters], Kresy [Borderlands] 1994, no. 18, p. 14). It should be noted that the performative presentation in the typography of what the poem is talking about has a close analogue in the tradition, broadly understood, of concrete poetry, referenced repeatedly – in the collections wszystkowiersze (everythingpoems), Przesuwanka (A Displacin’) and Dwanaście wierszy w kolorze (Twelve Poems in Color) – by Miłobędzka. Barbara Sienkiewicz writes fascinatingly on the avant-garde adventures of hypallage and the philosophical implications of the figure in her article “Prawdziwy koniec hypallage?” (The Real End of Hypallage? ; Teksty Drugie 2002, no. 3, pp. 212 –222). It appeared in the same form five years later in the book zbierane, gubione (1960 –2010) (collected, lost [1960-2010]), supplemented with gubione from 2008. We may treat as a curiosity rather than an interpretative trail to pursue (even a micrological one) the fact that the cover of zbierane, gubione designed by Jan Jaromir Aleksiun, depicts a comma separating two words, enlarged to enormous dimensions so that it occupies the entire centre of the composition. And not only to this one – the second person singular pronoun in the poem “[z twoimi rękami…]” ([with your hands…]) shifts from being capitalized (“złóż mnie z samych Ty” [assemble me from Yous only]), to being lower-case like the rest of the poem in the versions in both zbierane and zbierane, gubione. Aleksandra Zasępa, referencing Tymoteusz Karpowicz, writes of Miłobędzka’s use of a “method based on reification of the text. The objectification of speech can be revealed to represent the most perfect opportunity for translating the world.” A. Zasępa, Czas (w) poezji Krystyny Miłobędzkiej, p. 212. Szymutko adds his two cents on the potential fallibility of micrological readings: “To search for the extraordinary in the ordinary is a form of naïveté, for where is it supposed to come from? The mere formulations – expecting the unexpected, predicting the unpredictable, waiting for the unexpected … – sound absurd, since nothing so miraculous can happen, ca n chance to occur in literature’s well-regulated language.” S. Szymutko, Po co literatura jeszcze jest?, p. 145. A. Nawarecki, “Mikrologia, genologia, miniatura” (Micrology, Study of Genres, Miniature) in Miniatura i mikrologia (Miniature and Micrology) vol.1, ed. Nawarecki, Katowice 2000, p. 15. Ibid., p. 16. I have altered the quoted passage slightly to make it fit my sentence. H.U. Gumbrecht, The Powers of Philology: Dynamics of Textual Scholarship, Urbana-Chicago 2003, p. 7. A. Nawarecki, Mikrologia, genologia, miniatura, p. 21. Emphasis mine. Thirty years earlier, in a decidedly different language and style of thought, Jakobson anticipated Nawarecki: „A calculus of probability as well as an accurate comparison of poetic texts with other kinds of verbal messages demonstrates that the striking particularities in the poetic selection, accumulation, juxtaposition, distribution, and exclusion of diverse phonological and grammatical classes cannot be viewed as negligible accidentals governed by the rule of chance.” R. Jakobson, “Subliminal Verbal Patterning in Poetry,” in Verbal Art, Verbal Sign, Verbal Time, Minneapolis 1985, p. 59.